We offer professional window cleaning, pressure washing, solar panel cleaning, gutter unblocking and UPVC cleaning services for both residential and commercial clients. Our professional exterior cleaning services are available to residential clients in Helston, Hayle, St Ives, Porthleven, Mawgan, Mullion, Falmouth, Truro, Helford, Manaccan and Newquay, and our commercial services are available across the South West. 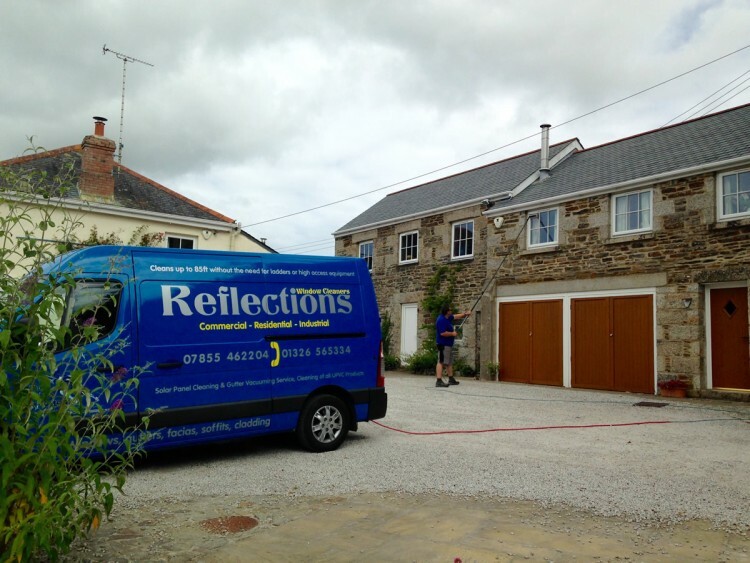 Reflections Window Cleaners have built a business based on high quality workmanship, attention to detail and customer satisfaction and we do all we can to make sure every customer is 100% happy with our services after every clean. We go the extra mile and clean window frames and sills every visit to keep the whole window sparkling. Call our friendly, uniformed team today on 07855 462204 or 01326 565334 to find out more or to book your clean!